"Mumbai Indians refused to trade or put me back into the auction," he revealed. It was not long ago when a young left arm spinner had made big news in the Indian Premier League. Playing for the Mumbai Indians, J Suchith scored a match winning 31 off 24 balls against the Kings XI Punjab on his IPL debut a couple of seasons ago. The left arm spinner, who was more than just handy with the bat in the lower middle-order, just lost his way in the premier tournament after the 2015 season. The then defending champions, Mumbai Indians, made him sit out of the lineup in 2016 season, and preferred Krunal Pandya in the playing eleven. As per the recent quotes in The Hindu, J Suchith looked back at how things unfolded for him, and expressed his disappointment for having missed out despite have been successful for the franchise. “Though I did well in 2015, I didn’t get to play the first game in 2016. I was not even given a proper explanation as to why I wasn’t a part of the XI. 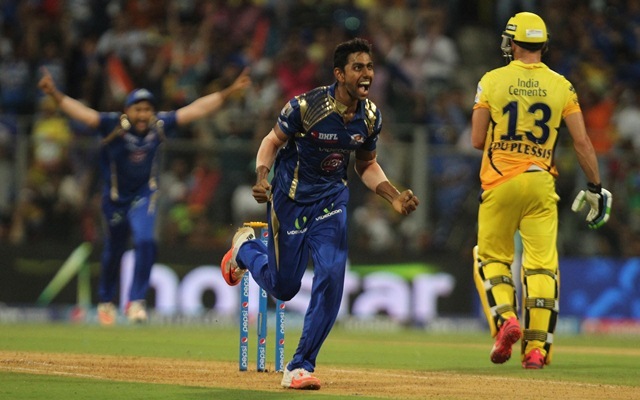 I played the second game where I didn’t do well, and I never played again,” J Suchith quoted. “Before the third game, the franchise said Krunal Pandya is new and the foreigners don’t know how to play him as they wouldn’t have seen him. They wanted to try out Krunal,” he added further. A request to trade turned down? Speaking further on the same lines, the youngster revealed that he wanted some match time desperately. Warming the bench did no good to him. He requested the team manager to trade him to the Delhi Capitals. But his request was also turned down, and he was assured that he would get his chances in the tournament. However, that never really happened. Now, he is among the unsold forgotten players of the league. “Before the player retention for 2017, I had requested Rahul Sanghvi [MI team manager] to trade me to some other team. Delhi [Capitals] was interested in me. I wanted some game time. He refused to trade or put me back into the auction. He had convinced me that the franchise is going to back me and make me play but that didn’t happen. The franchise was very keen on playing Krunal ahead of me. The communication was very limited between me and the officials,” the Karnataka player revealed. Well, the disappointment for J Suchith has not been restricted to the IPL only. Even in the domestic circuit, he has often been making way for the likes of K Gowtham and Shreyas Gopal in the Karnataka lineup. Suchith exclaimed that he has every quality to do the things that Gowtham and Gopal are doing, but he is being ignored. It is worth noting that he had scalped 9 wickets against Saurashtra in the league game this season. But he was dropped from the side in the semi-final against the same Saurashtra side. “I sat out eight games last season, it was really hard. It was more of a challenge as I knew I had it in me to get wickets or do what Gowtham does, or what Shreyas does. I worked really hard with Raghuram Bhat [coach] in the off-season. As a cricketer, you can only prepare and be mentally ready. It is taxing for a player to wait. Before I played this season, I had to wait for around 14 games,” the dejected youngster conceded.